Remember our buddy Matt? You know, the dude that makes all of those ridiculously cool, hand-painted, zombified recreations of the movie posters from the biggest and best Hollywood blockbusters? Of course you do! You remember this post, this post, this post, this post, and even this post from ZomBCon when we hung out with Matt up in Seattle. Well, here's the skinny. Matt's throwing a little bit of a party over on Kickstarter right now to get his newest project off the ground: a 200 page, foil embossed collection of all the bloodiest and best resurrections from the last five years. What's more, over half of the images are brand-freakin-new, never before seen, gore-infested masterpieces. Yeah! See that right there? That's right! You're looking at the limited edition, one-of-a-kind, ZOMBIES&Toys Artist Series Button Sets featuring the art of none other than our buddy Matt Busch! There are only two places in the world you'll be able to pick up one of these sets and you're looking at both of them right here. But, you don't have to drop $100 to get sweet rewards (although that's the only way to get the button set). For as little as $5, you can get name-dropped! Absolutely! Matt will include YOUR NAME in the finished book and send a special, personal "thank you" out into the world letting everyone know that you had a hand in on digging this whole thing up! 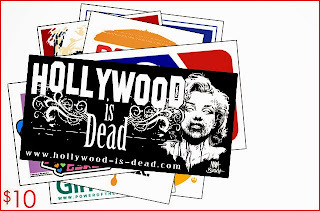 Drop $10, and you get some killer stickers to plaster all over your tomb. Now, we could go on and list all of the incredible rewards Matt's putting up, but you're better off just going straight to the source. We've already put our money down, so what are you waiting for? 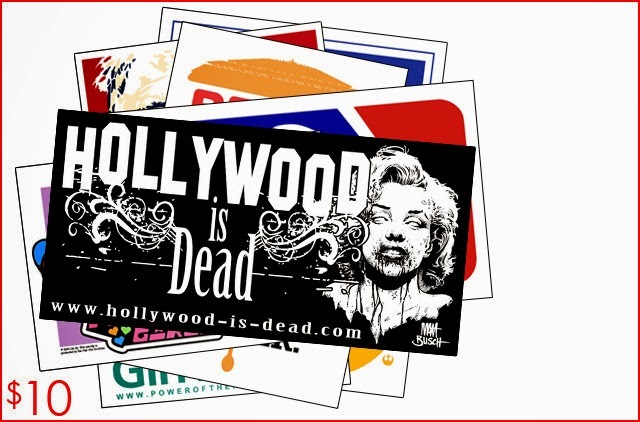 Swing on over to the HOLLYWOOD IS DEAD Coffee Table Art Book campaign over at Kickstarter, and let's make this thing happen!